Dear Comrades, Please find the AIIEA Circular No. 05/2017 as an attachment. This is regarding discussion the AIIEA delegation had with Chairman, LIC on 4.2.17. Dear Comrades, Please find the AIIEA Circular No. 04/2017 as an attachment. With profound sorrow and deep grief, we have to inform that Com R. Govindarajan, Former Joint Secretary, AIIEA and a foremost leader of the insurance employees’ movement passed away around 7.10 pm on 18 th February 2017. The end was sudden due to a massive cardiac arrest. He was 81 and leaves behind a son and daughter and thousands of admirers in grief. Hundreds of insurance employees assembled to pay their respect and participate in the final journey on 19 th February. 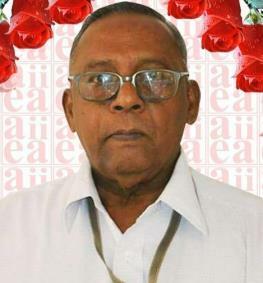 The General Secretary, AIIEA paid floral tributes to Com Govindarajan. Please find the attachment, AIIEA circular no 06/2017 is appended on the above subject. Please find attachment for the circular no. 1 & 2 of Standing Committee. Dear Comrades, Please find attached herewith AIIPA Circular No 5. Dear Comrades, Please find attached herewith circular no 4. Dear Comrades, Please find the attachment on the above subject. Dear Comrades, Please find attached herewith circular no 3. Copyright © 2016 CZIEA. All Rights Reserved.